Kota pleads with Kaito, is anger all that’s left in him? Yes, Kaito says, he wants to end this world where the weak are punished and being strong is the only thing that is important. He wants the power to destroy it all. Real Kota and Kaito give each other everything they’ve got, neither one ever getting the upper hand for more than a second. 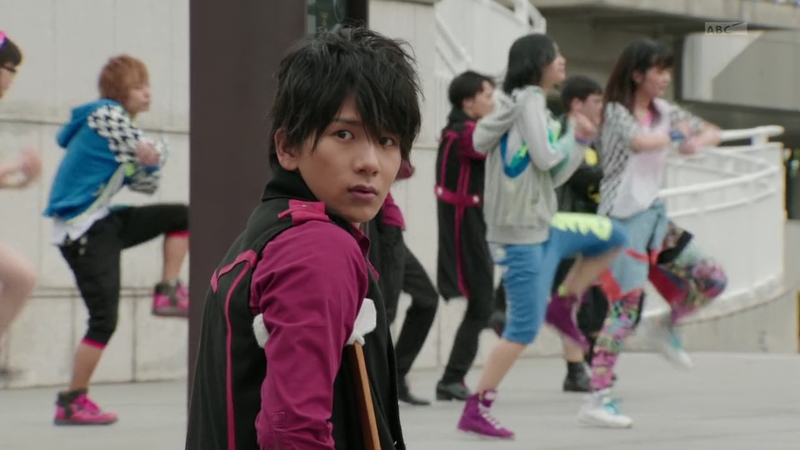 But Kaito manages to knock the Hinawadaidai-DJ-ju right out of Kota’s hands and he proceeds to knock him back. Kaito delivers a near-final blow, which brings Kota to his knees. In both worlds, Kaito goes to deliver a final strike, but Kota blocks the sword with his arm. He grabs the sword and karate chops it in half. 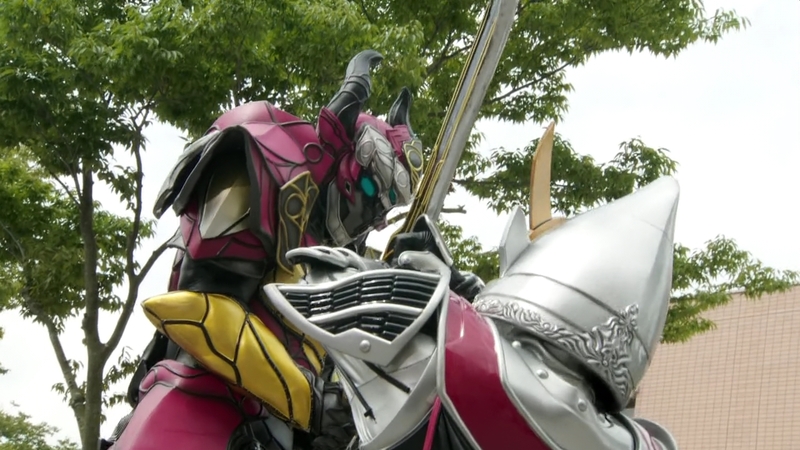 That gives Kota the opening to charge straight through to Kaito’s stomach and use the pointed end of the sword he’s just chopped off. Both dehenshining, Kota rushes to catch Kaito who collapses to the ground. 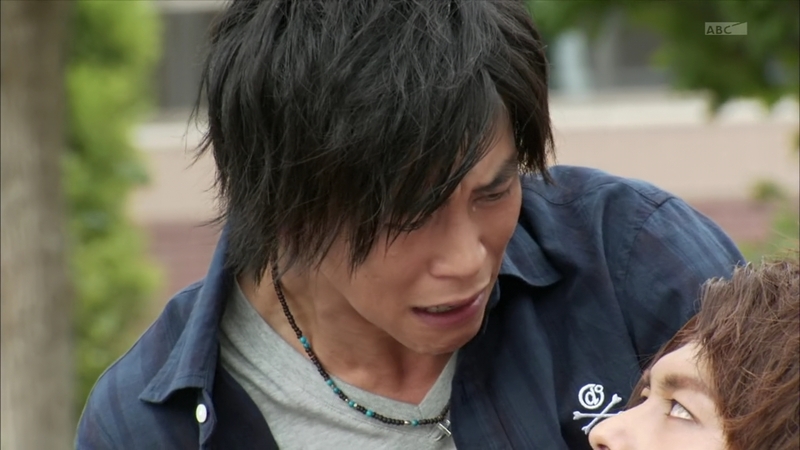 Kota has a dying Kaito in his arms. An oath to never abandon those who call out their prayers. That is everything that makes who I am, Kota replies. 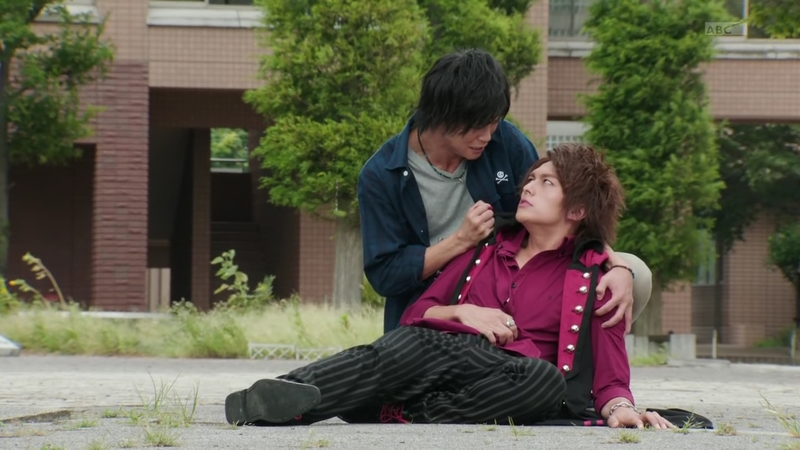 Kaito light fist bumps Kota’s chest before he takes his last breath. 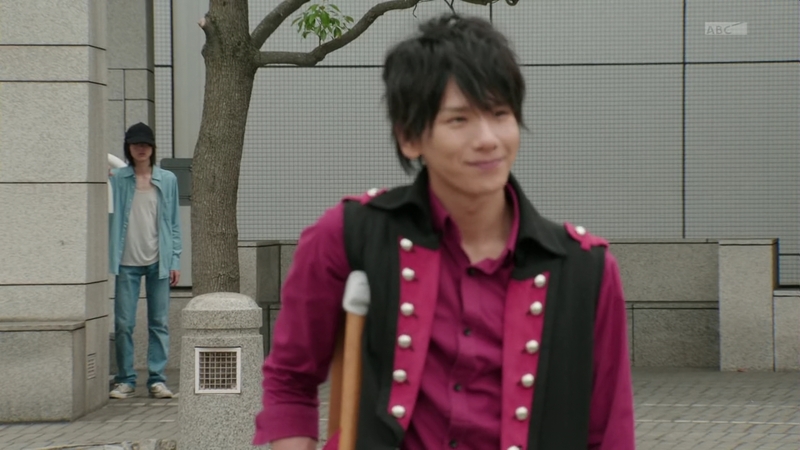 Kota gently sets Kaito on the ground and stands. Mai watches the same scene in the other world. Sagara’s voice tells Mai to return to her world and perform her job now that the future has been set. 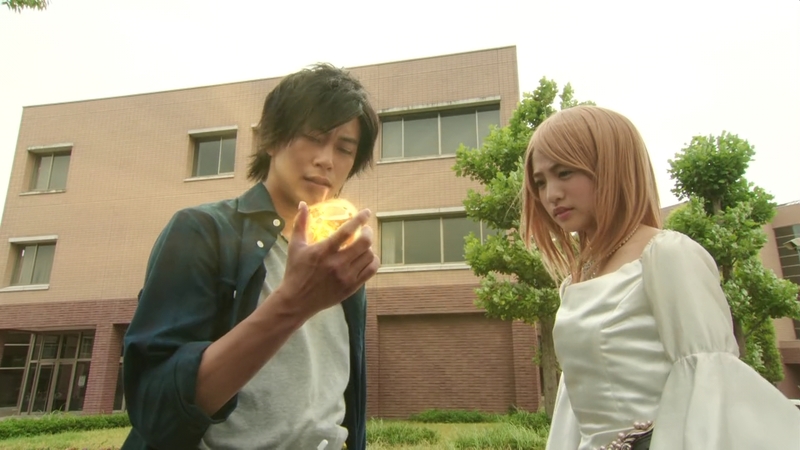 Mai takes the Golden Fruit and hands it to Kota. Now it is time for Beginning Kota to end this world. Indeed, this new power that Kota possesses can destroy the world, sacrificing everything he had been protecting. But he won’t use it. He refuses. Don’t be absurd! Sagara says. If they don’t sacrifice the world, there will be no future for Mr. and Mrs. Beginning. 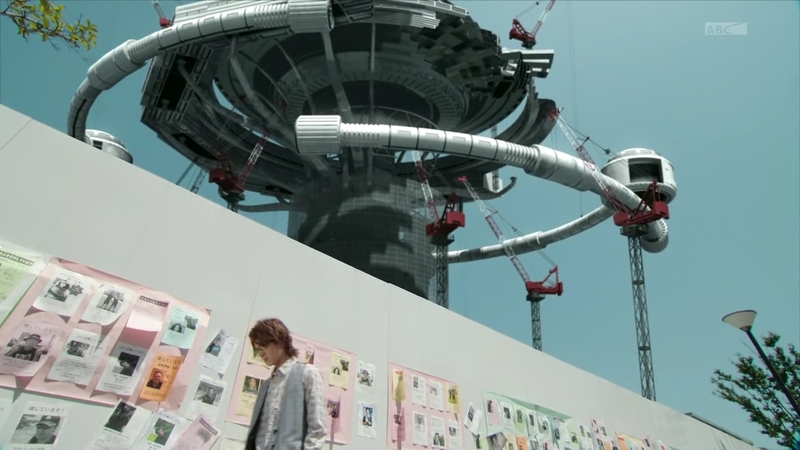 Kota says if there is no future here, then they will find another world. There’s always a way if you don’t give up. Kota waves his hand and a large Crack opens in the sky. This time, it is a Crack to the universe and a planet unknown to others. 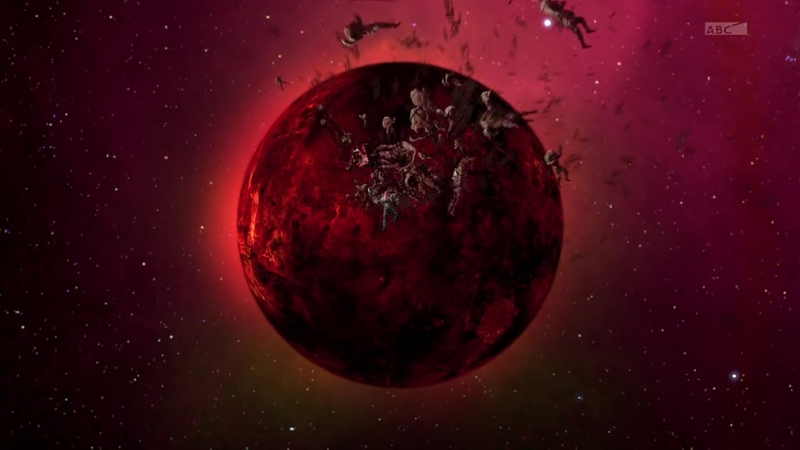 The Helheim vines start to recede from Zawame and they, as well as the Inves are sucked through the Crack and onto the new planet, their new stage. Instead of destroying this world, Kota will just create a new one. 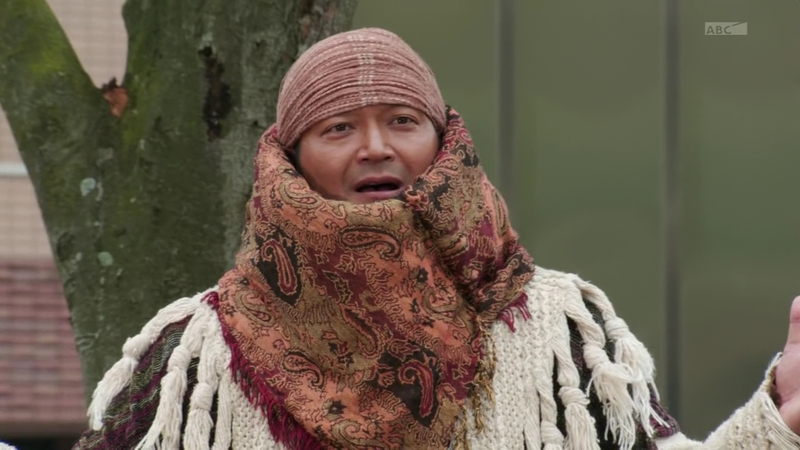 Are you crazy, Sagara says. There is no shred of light of life on that planet. How could the two of them even survive? Kota says he will just remake the world as he wishes. He will fear no darkness as long as he has this power. He is also not alone. And no matter how painful the future may be, they will be able to overcome it together. 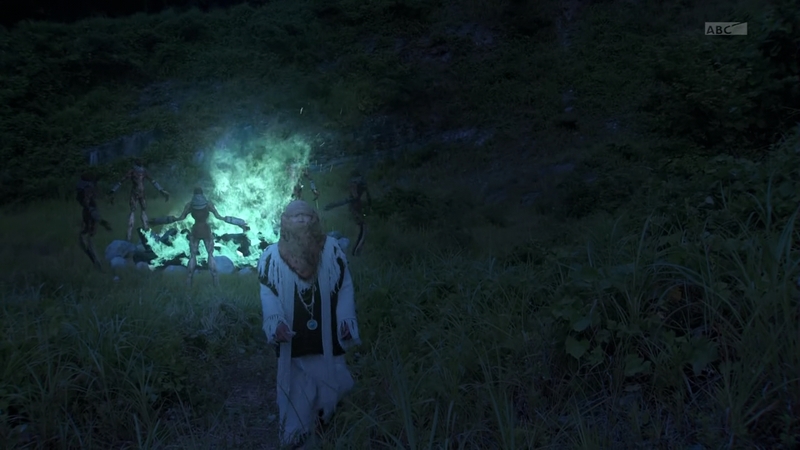 Sagara asks if they are just going to give up this bright, blue planet paradise full of life. Kota says the future is always in the dark, so it is worth bringing light to it. “It’s your job just to watch, right?” Kota asks. Kota thanks him and tells Mai it is time for them to go. They fly up into the Crack, which zips up behind them. Three months later, the world slowly tries to rebuild and return to any sense of normalcy. 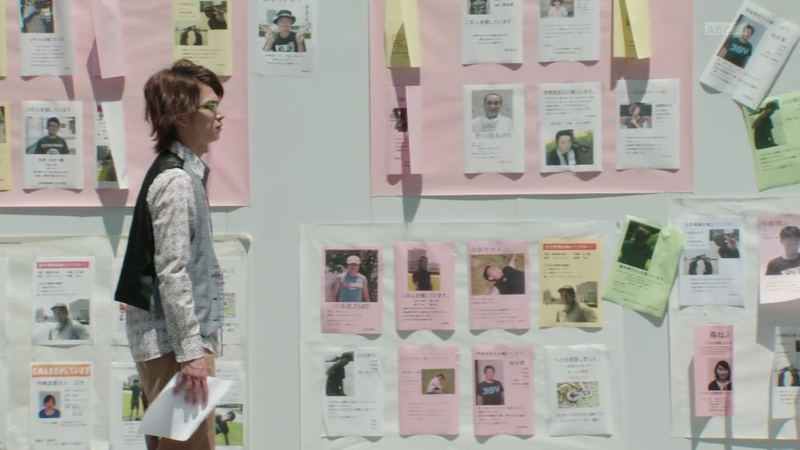 Jonouchi is at a wall filled with flyers of the missing. He posts one of Hase Ryoji before walking away. Behind the wall, Yggdrasill Tower is being dismantled. 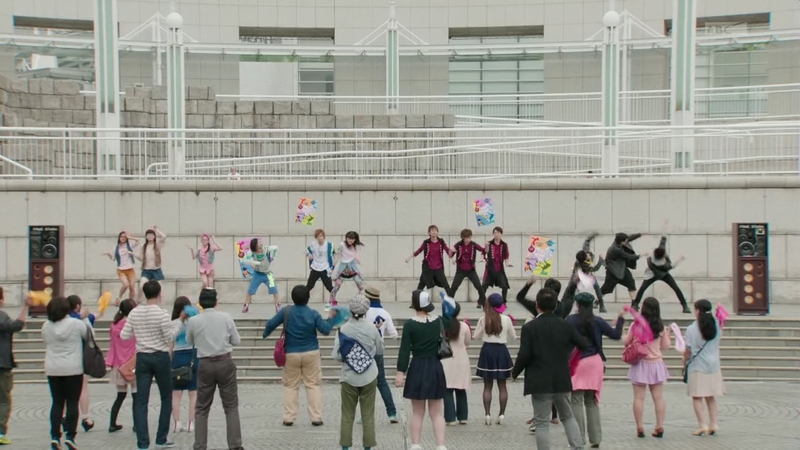 Across town, a very alive, but crutched Zack smiles as Teams Gaim, Baron, Raid Wild and Invitto are enthusiastically dancing on stage together. Around the corner behind Zack, a baseball capped Mitchi watches. Meanwhile, Jonouchi has joined Oren at the grand opening of a new Charmant Shop. Jonouchi says it is nice to see Zawame so lively again. Oren says it shows how many people consider Zawame to be home even without Yggdrasill. Jonouchi again wonders where Ryoji could be, but Oren tries to get him to instead focus on the present and how to move forward while the world is still in shambles. “No, I don’t really think that’s the end of that,” Jonouchi counters. 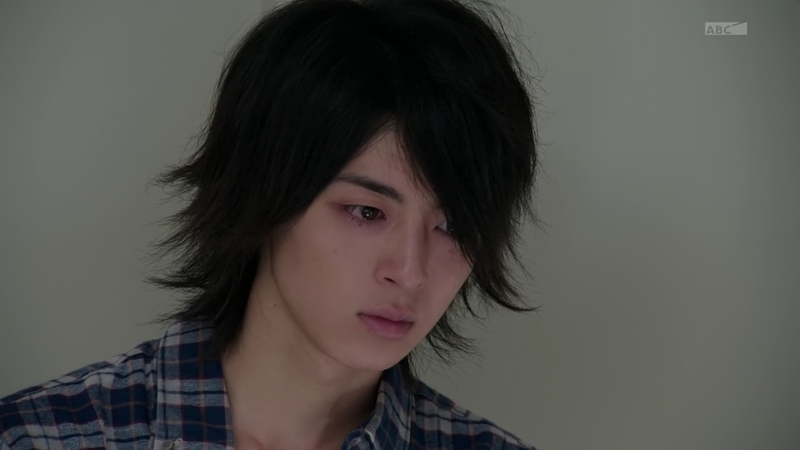 Oren agrees, but he adds that Mitsuzane won’t forget the mistakes he’s made. Zack turns and sees Mitchi walking away. He calls out and hobbles toward him. Mitchi turns to walk away without saying a word, but Zack tries to stop him. 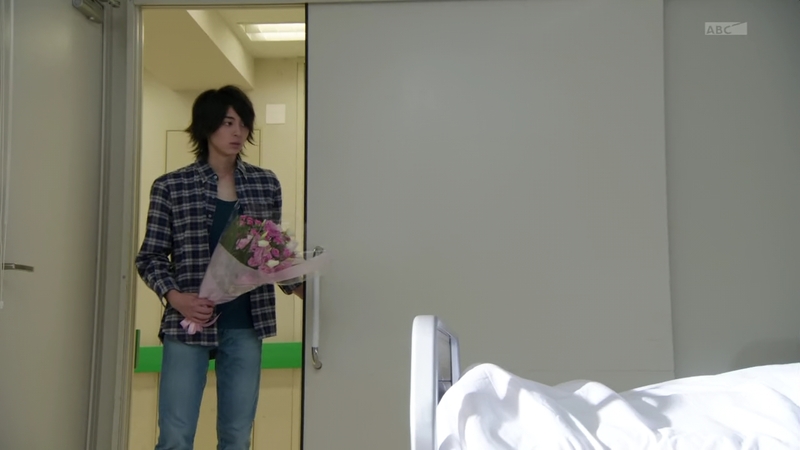 Mitsuzane brings a bouquet of flowers to a hospital room. 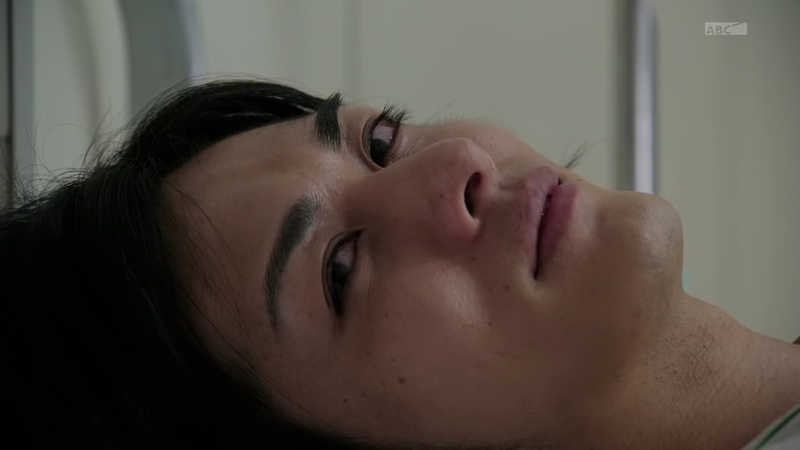 Mitchi remembers the doctor first telling him that Takatora had drifted far offshore before a ship rescued him. It’s a miracle he’s alive at all. As for whether he can recover, the doctor says the brain damage is too severe for modern medicine to help. 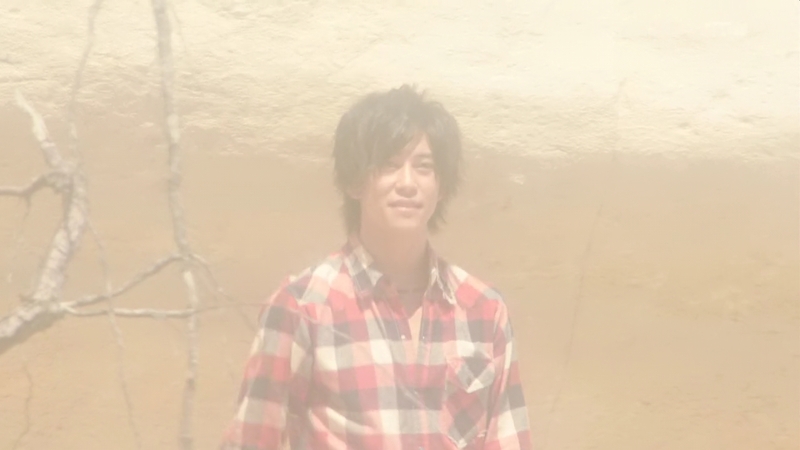 Takatora is by the ocean, wondering where he is. It is a very bright day. 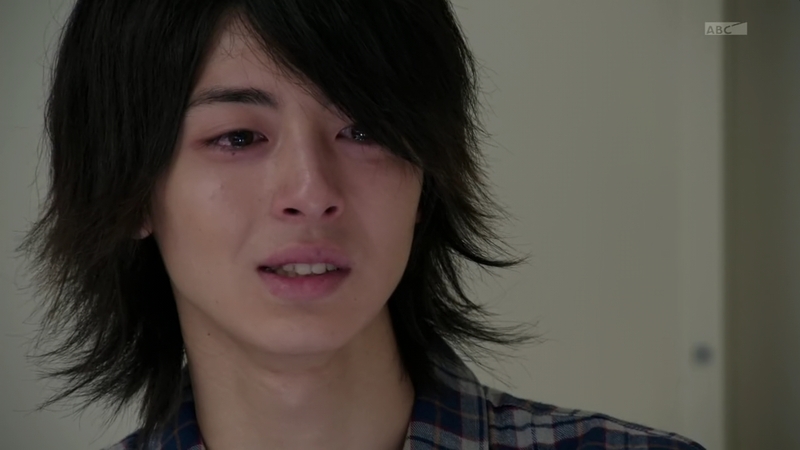 Kota says Takatora has suffered enough, having such a heavy burden to carry on his own. But Kota has one request to ask of him. 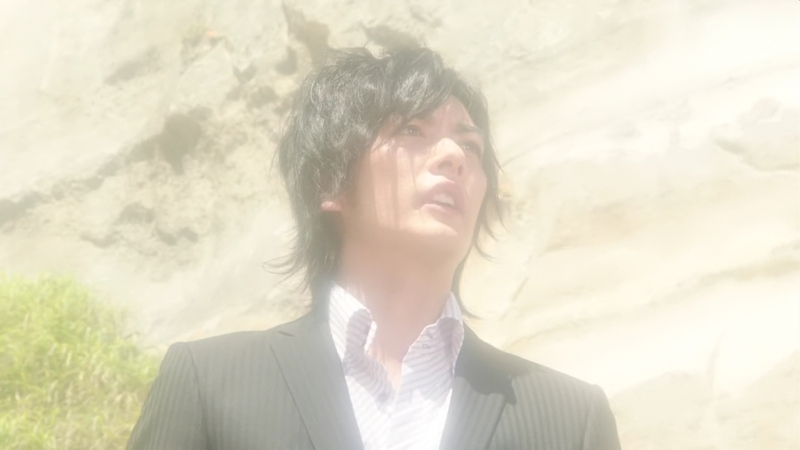 “But will he listen to me?” Takatora asks. As the bright scene fades way, Mitchi notices his brother moving for the first time. Takatora turns to his little brother and smiles. I cannot even. Like seriously. Okay, so I assume this was the “real” finale and that next week is just a fun, one-off epilogue like last year’s Wizard specials were, right? 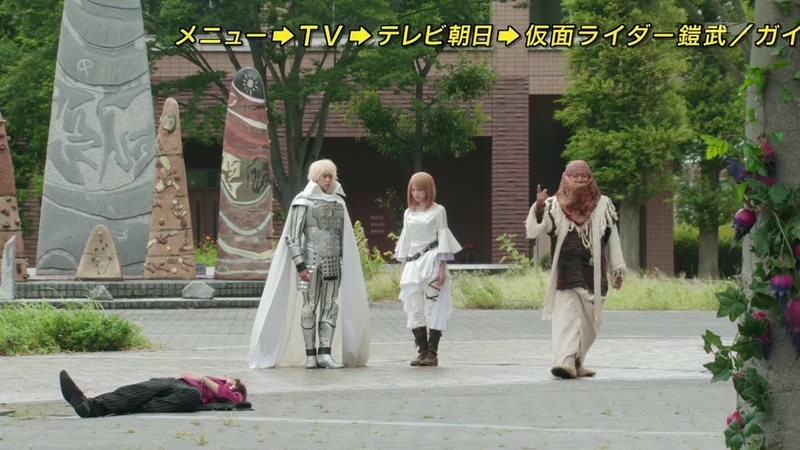 lol, there were more religious undertones here than the angel-themed Goseiger for goodness sakes. But that’s a good thing, since Urobuchi was able to craft an incredible story that transcended, pretty much everything, honestly. It drew from religious and non-religious teaching and mythology about creation and rebirth and created a brand new twisted take on it all. This final episode worked to sell the idea that no matter what has happened in the past, there is always hope. You don’t necessarily need to kill something or bring something to an end just to change or create a new future. That applied to Kota and Mai’s decision to elope start a new world together and it applied to Kaito’s right idea-wrong approach demise. 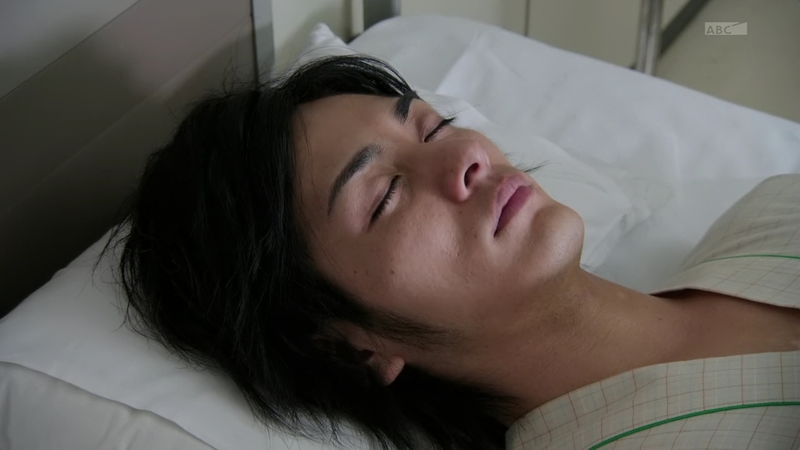 And maybe most of all, it applied to little Mr. Mitsuzane Kureshima who is absolutely ready to live his life hating himself and depriving himself of any peace until Takatora, we assume, will teach him that very idea. It’s been an emotionally draining ride, seeing this “snake” nudge the pieces together toward the destruction and rebirth he seems to get off on. But what made watching this even more interesting for me was that I watched Kamen Rider Taisen right before seeing this episode was subbed. So, SPOILER ALERT! 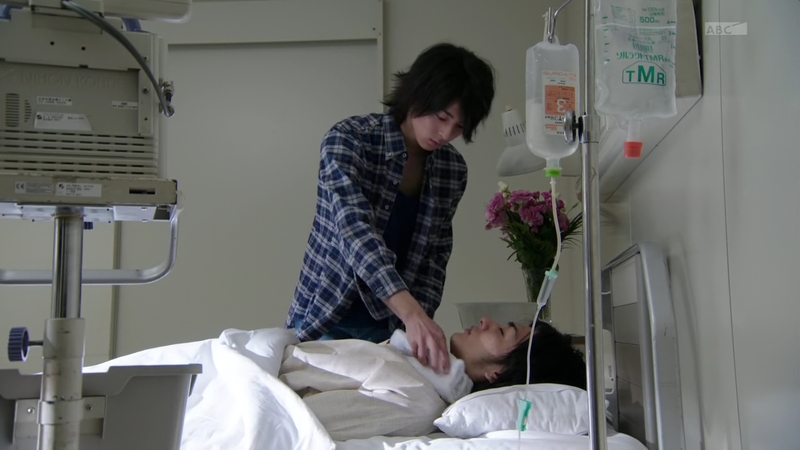 Kamen Rider Taisen was basically all about true strength and power being that which comes with kindness. Or something like that. 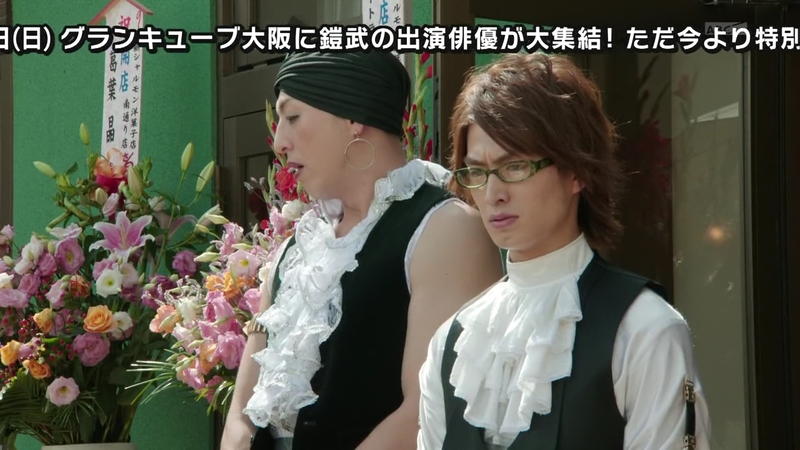 But you could say the same here for Gaim the series as well. It is because of Kota’s resolve (which was affirmed several times of course) and sacrifice that the world was saved. And how others learned what it meant to truly be strong. Sure, Kota got all the strongest power-ups. But his strength of will is what made it all possible. We saw how Kota, maybe reluctantly, initially accepted the power. 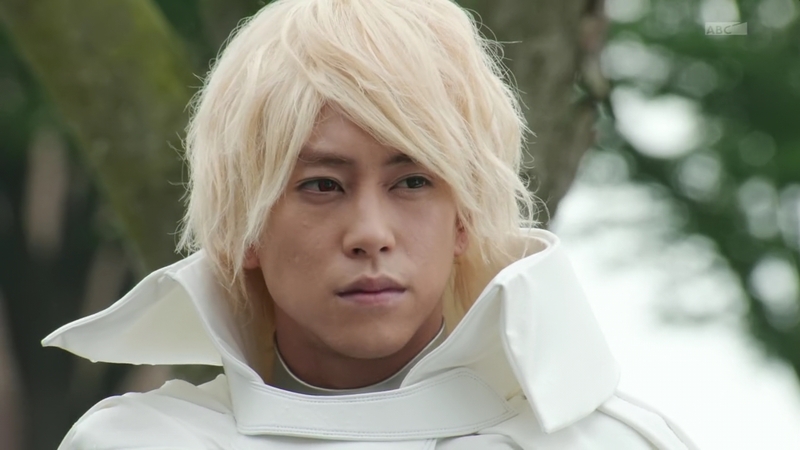 We saw him several times close to needing Haruto to come in and save him from despair. But he’d always pull himself up and move forward, as he did again in the end. Pending the final, final episode, I thought this was a great and very unique, but satisfying ending. Now to the specifics of this episode. 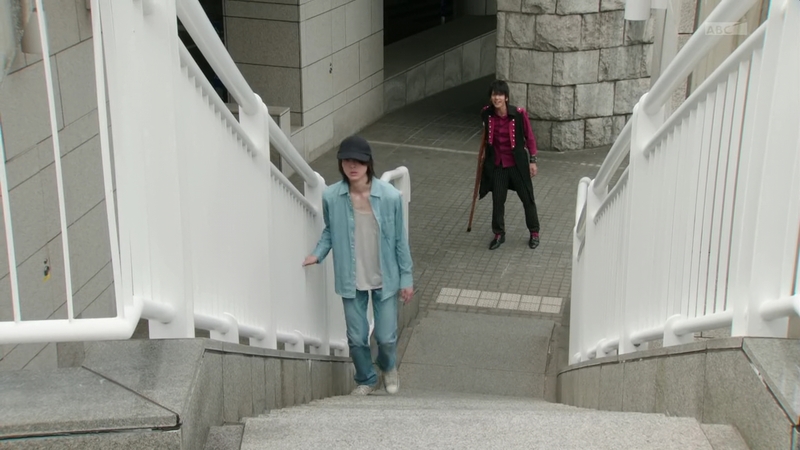 I really liked seeing Jonouchi at that wall, used as a way to see the world is a long way from, but on their way to recovery. Not letting him know about Hase is interesting. I wonder if that will play into the storyline for the final episode. Zack surviving was expected. But it was great to see that he will likely be the head of the Beat Riders moving forward. Zack is really a great example of how a character can really emerge through the course of a season. And finally, where is Akira though?! Not even in the final episode at all! I know she could very well appear in the next episode, but everyone else got their tidy bow in this episode. I think we should’ve at least seen her even in just a quick scene at home, looking at a picture of Kota or something. I mean, come on now. That actually made me the most sad from this episode. Sorry Kaito. ← The Amazing Race Philippines Season 2 Full Trailer is Here! 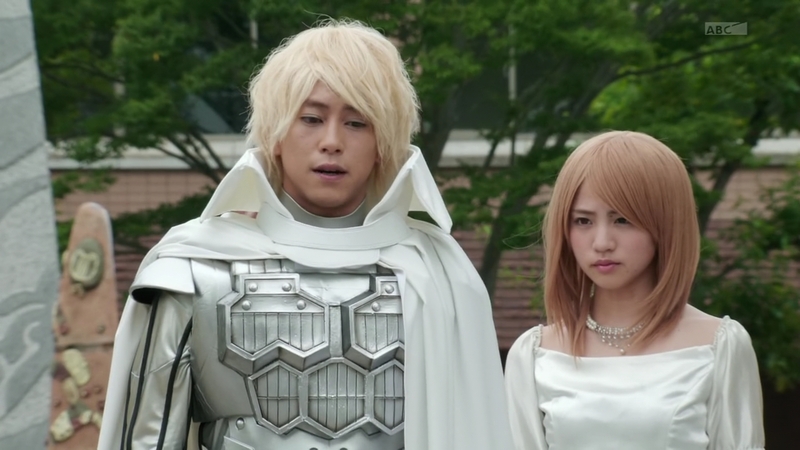 One thing that I noticed is that, while Kouta’s, Kaito’s, and Mai’s parents were all explicitly said to be dead, they were a bit more ambiguous with Micchy’s and Takatora’s. I was going to point that out as a bit of a plot hole, but then I realized a bit of fridge horror. 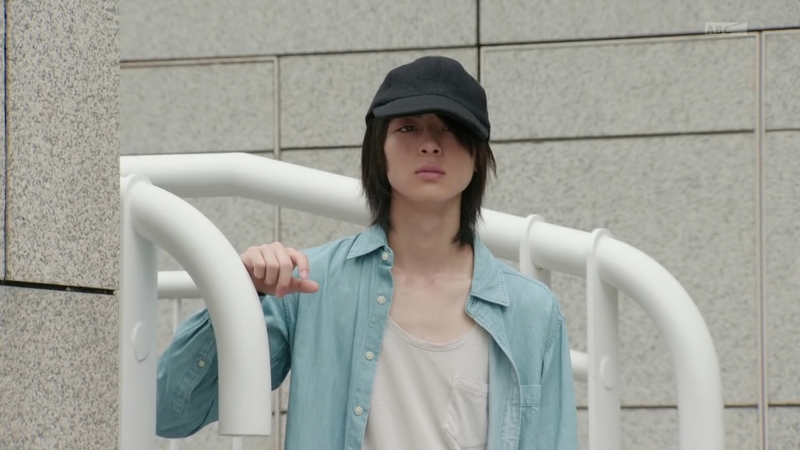 All of the young beat riders, particularly those who became armored riders, don’t have parents. At all. Meaning these kids had their lives going wayward because they don’t have parents to look after them and they were forced to grow up on their own. I don’t know if it is intentional or what. Now for this episode. Yep, this is very much the classic Urobuchi ending (I also consider the last episode to be more of an epilogue, since Gen is not the one writing it). In fact, it runs in the same vein as his endings of Madoka and Fate Zero. And now, I might have to revise my interpretation of the man. If you read more about him, you will note that many think of him believing in despair above everything (as evidence of his tendency to have high death counts in his works, hence the name “Urobutcher”). But seeing the endings of his three best known works (Madoka, Fate/Zero, Gaim), I am inclined to believe that it goes the other way around and he is actually a firm believer in hope. He is more of the “glass half-empty” person, but he sees water in it nonetheless. So, he might be argung that, even with all that despair, there is always hope, but you must find it. And hey, Junouchi and Oren get to live happily, reopening Charmant. That made me smile. 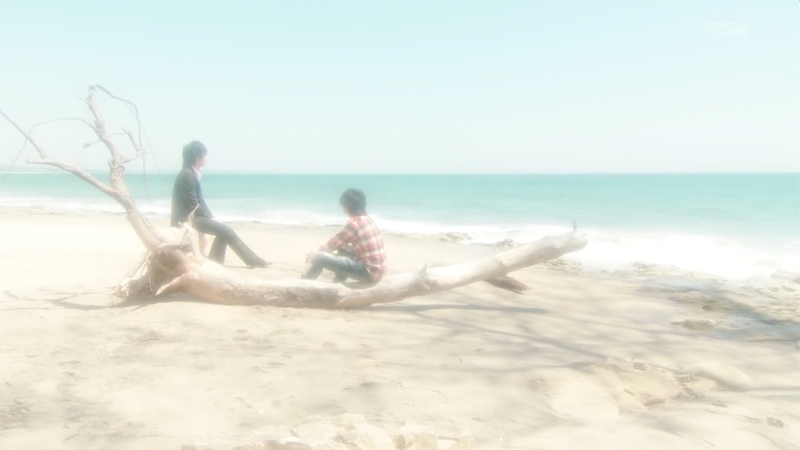 Also, that dream sequence between Takatora and Kouta is probably one of the best examples of such a scene that I have seen. And as a side note, this really makes me disappointed that local teleseryes can’t seem to pull off this kind of discourses (hope vs. despair). Juan dela Cruz (the one with Coco Martin) could have done it, but they ultimately reverted back to the typical teleserye good vs. evil deal. Heck, even Princess and I could have pulled it off, what with the writers actually opening sociopolitical tops. Too bad these poor writers were sabotaged by their network bosses (I still consider this one that network’s biggest embarrassment). The problem seems to be that local networks seem to think that such topics are too intellectual for the masses, who they still think to be contented with only dumb entertainment. Using the most depressing or most horrible situation to highlight hope is definitely an excellent idea and Urobuchi did an amazing job here. Yeah I kinda feel sorry for Kaito he never got a chance to tell Mai how he felt because he hid his feelings.